Do you love blue cheese? Do you love bacon? 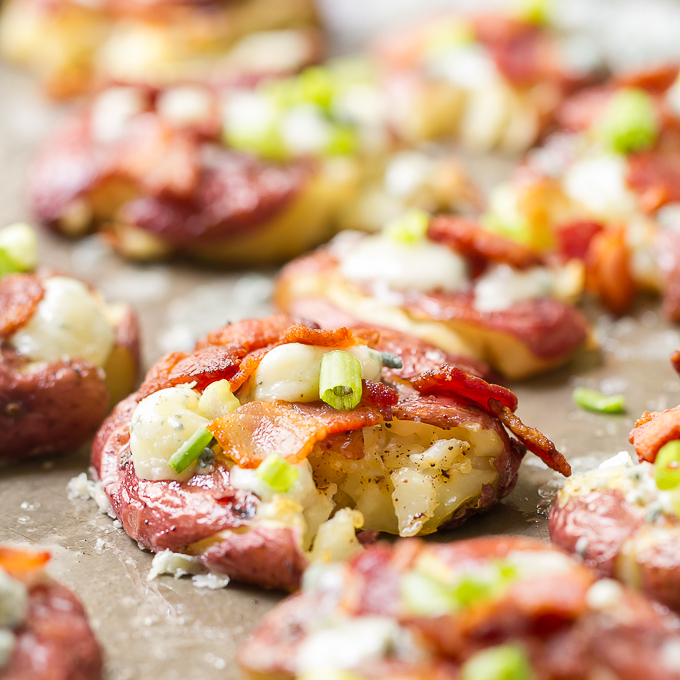 If you answered yes, then you’ll love these creamy, crispy Smashed Potatoes with Blue Cheese and Bacon. Don’t love blue cheese? No problem, just substitute another cheese! But, if you don’t love bacon (really, who doesn’t love bacon?) then I don’t know what to tell ya! I originally bought some blue cheese and bacon with all good intent to roast some brussels sprouts and add the cheese and bacon to them. Not really very original, but something my husband likes. Since I was cooking and messing up the kitchen, I wanted to make something to post here but I just wasn’t feeling the brussels sprouts dish today. I guess I was in more of a potato mood. I’ve seen various recipes for smashed, or crushed, whatever you want to call them, potatoes with rosemary and olive oil. Probably one of my most favorite ways to prepare potatoes is roasted with rosemary and olive oil (and garlic). So I thought I’d try crushing them this time and use up my blue cheese and bacon. Start off with boiling the little potatoes (whole). I used baby red potatoes, but you could use any little potatoes you like. While the potatoes are doing their thing, cook up some bacon. Once the potatoes are tender, drain them and place them on a greased baking sheet (I greased the sheet with the bacon grease!!!). Then crush them with the bottom of a glass. Brush the potatoes with more bacon grease and pop them in the oven until crispy and golden. After that, top them with some diced bacon and crumbled blue cheese and back in the oven they go until the cheese is melted. Simple and ridiculously delicious. 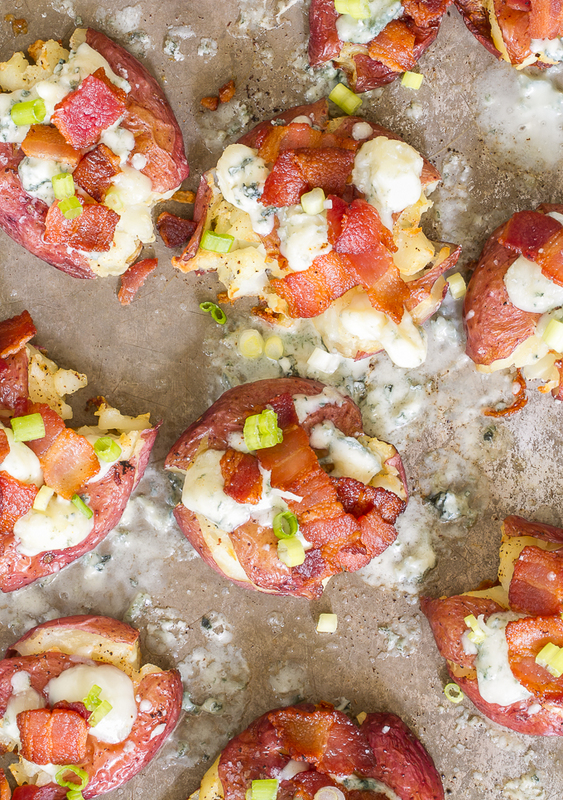 These Smashed Potatoes with Blue Cheese and Bacon make a spectacular side dish or, better yet, a tasty little appetizer for your next get together! Bring big pot of water to boil and add whole potatoes. Boil until tender, about 15 minutes or so. Drain potatoes. While potatoes are boiling, cook bacon in skillet. Remove bacon to drain, then dice or crumble bacon. Reserve bacon grease. Grease baking sheet with some bacon grease. Place potatoes on baking sheet. With the bottom of a glass, smash potatoes. Brush potatoes with more bacon grease. You can lightly salt the potatoes if desired. Roast potatoes in oven until they get crispy and golden to your liking (about 15 minutes or so). Remove from oven. Top with blue cheese and bacon. Return to oven to melt the cheese. Remove and garnish with sliced green onions. Hmmm…..I don’t eat cheese or bacon, but they look good and your pictures are gorgeous! Ha! well maybe some vegan cheese and fake-on (fake bacon)???? Or just good ol’ olive oil, garlic and rosemary is really yummy too!!! Now that sounds like a great suggestion Karen!